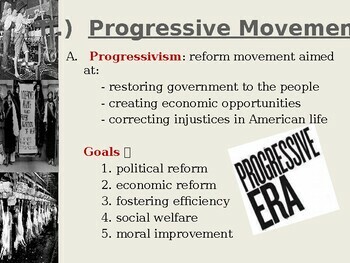 The following is a 30 slide PPT which identifies and describe the Progressive Era from its origins and goals through the presidency of Theodore Roosevelt. 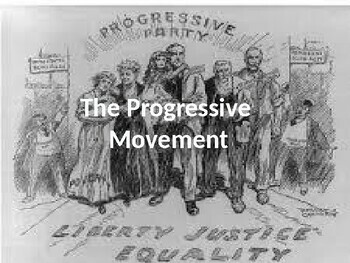 This PPT begins with Muckrakers leading the charge through their investigative reporting, then moves onto defining Progressivism and identifying and describing the five overall goals of Progressivism. The PPT then transitions to describe how women played a major role in reforms through four slides before moving to the life and presidency of Theodore Roosevelt. After introducing TR, the PPT breaks down his Square Deal in multiple slides describing Trust Busting, Regulations, and Conservation before ending with Progressivism and Civil Rights. 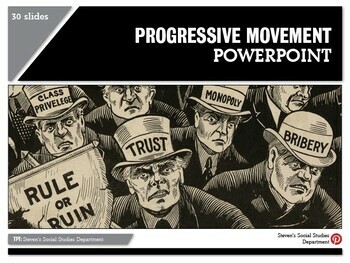 This PPT is filled with great illustrations, period era primary source photographs, political cartoons which can be discussed and broken down via discussion, as well a text which can easily be transcribed for students as they take notes with key terms and ideas typed out in "bold RED". 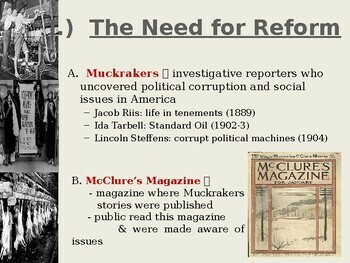 I use "Study Guide Questions" for students to complete in pairs to complete out unit of study on the Progressive Era. These questions come in the form of 2 different sets of questions(one for Taft and one for Wilson). Both will soon be available with keys for purchase in my store to complete this unit of study.